Today marks the Winter Solstice! 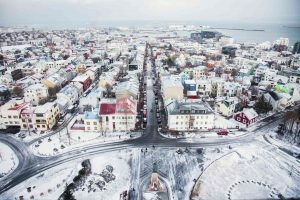 In Reykjavik, the sun rises at 11:23 am and sets at 3:30 pm, making it the shortest day and the longest night of the year in the Northern Hemisphere. As Icelanders enjoy the fantastic views of the early night sky, they also prepare for the period of Christmas that begins December 23rd and ends on the 6th of January. The culture is rich in Christmas traditions spreading from religious practice to traditional folklore. The celebration is deeply rooted in the people of Iceland, and for a festival of lights, the crisp darkness creates the perfect canvas. Religious Icelanders attend st. Þorlákur’s Mass on December 23rd, named after Þorlákur Þórhallsson, a 12th-century priest in Iceland that died in 1193. Traditionally on the last day of the Christmas fast, no one is supposed to eat meat, so a dish of fermented skate is served. Despite the pungent smell of the fermented fish, eating skate is still a tradition amongst many Icelanders. This night may arguably be the biggest party of the entire year. All citizens are permitted to light fireworks and the citizens take advantage, sending fireworks into the night sky well into the morning light. At midnight, firetrucks and harbored ships ring their bells and blow their horns in welcome of the New Year. This is the biggest holiday of the year in Iceland, and almost every shop and store is closed from noon on Christmas Eve until December 27th. Christmas is a culmination of celebrating the birth of Christ and celebrating the beginning of the lengthening daylight hours. The Icelandic word for Christmas, jól, contains no reference to Christ or to the church. It is a Norse word and also existed in Old English as Yule. If you’re visiting Iceland for the holiday season, take a few common phrases with you! “Get ég fengið heitt kakó með rjóma?” Can I have a cup of hot cocoa with whipped cream, please? “Einn jólabjór, takk.” One Christmas beer, thank you. AESU offers an Iceland Expedition for 5 days. Come see The Northern Lights and bathe in The Blue Lagoon in Reykjavík, one of the liveliest cities filled with legendary nightlife. This entry was posted on Wednesday, December 21st, 2016	at 11:20 am	. You can follow any responses to this entry through the RSS 2.0	feed. Both comments and pings are currently closed.